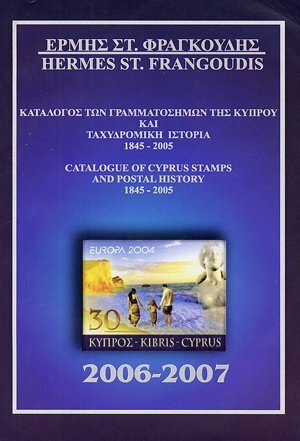 Catalogue of Cyprus Stamps and Postal History 1845-2005. Over 380 pages with all Cyprus stamps issued from 1880 to 2005. All stamps are depicted very clearly, in their actual size and colour. The catalogue contains full and accurate historical details and other useful information. It also includes a brief historical note on the postal history of Cyprus from 1845 to 1880. All text appears in Greek and English. The catalogue is printed in small size, non-reflective paper of excellent quality, so as to maximise user-friendliness and the clarity of illustrations.